What if I disagree with the decision reached in the PD&O? How much time do I have to file a Petition for Review? What must be in a Petition for Review? Can I get transcripts of the hearings? Can I get an extension of time to file a Petition for Review? Where do I find rules about Petitions for Review? What if no one files a Petition for Review within the time allowed? 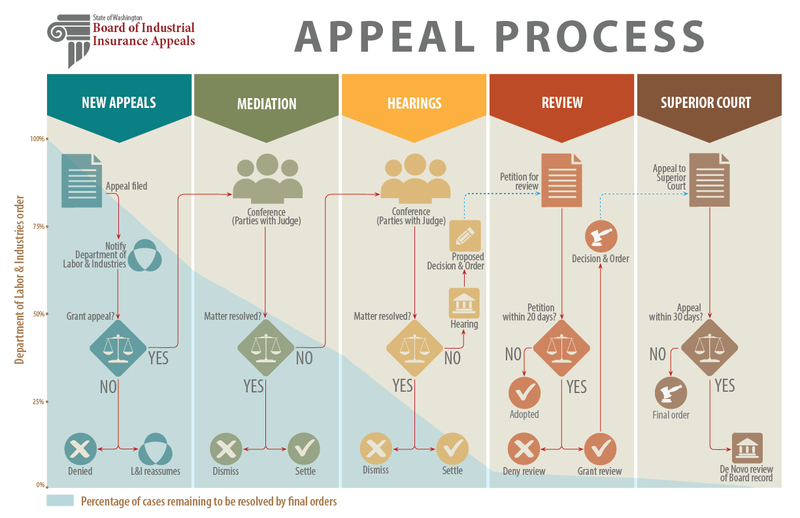 What if a Petition for Review is filed? and title it "Petition for Review." Note "PETITION FOR REVIEW" on the first page. 3. Any rulings made by the judge that you think are incorrect. 4. A "Declaration of Receipt" stating the date the PD&O was received. Service, properly stamped and addressed. proof of the mailing date. If you file online or by fax, we must receive it by 5 p.m. on the date of your deadline. Petitions received after 5 p.m. will be deemed filed the next business day. on the mailing cover page included with the PD&O. Yes, we will provide you with copies of the transcripts, depositions, and exhibits in your case free of charge. Send your request for these documents to transcripts@biia.wa.gov. 1. Be in writing and should state the reasons why the extension is needed. 2. Be filed with the BIIA's Olympia office within 20 days from the date of receipt of the PD&O. 3. Include a "Declaration of Receipt" stating the date you received the PD&O. within the 20-day time period unless the Board grants you an extension. You can find statutes and rules in the Revised Code of Washington (RCW Chapter 51.52) and Washington Administrative Code (WAC 263-12). These are legal publications available in law libraries or online at Washington State Legislature website. Most of these rules can be found in the BIIA's Rules of Practice and Procedure. The PD&O becomes the final order of the Board. You cannot appeal to superior court. The Board will determine whether to grant or deny the petition following a review of the record based on the grounds detailed in the Petition for Review and the evidence cited in the record in support thereof. the final order of the Board. of the date the Petition for Review was filed.